It was late afternoon by the time we stopped by Ginger and White in Hampstead. The warm weather meant that we could enjoy time spent sitting outdoors in the little alleyway in front of the café. We had been taking a friend around the various sights (and foodie places) of London and so stopped here before heading back home. 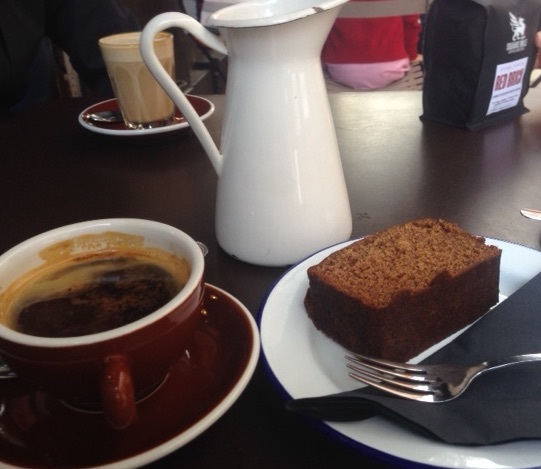 The long black, cortado and soya latte were all very well done and, while the others had enjoyed a crepe at La Creperie de Hampstead just around the corner, I took the opportunity to try the excellent banana bread on offer at Ginger and White. There was a fairly good selection of cakes on offer, but sadly those that the staff could confidently affirm were nut free were far fewer. However, the moist and tasty banana bread was a good option anyway. Coffee was roasted by Square Mile and there were also Square Mile beans available for purchase should you wish to take some home with you. While the café was fairly busy, it was nevertheless a relaxing place to sit and watch the people of Hampstead go by. Everything is connected. From the lights to your cup of tea. As I was looking around, wondering what the physics part of this cafe-physics review would be, I had what you could call a “light-bulb moment”. 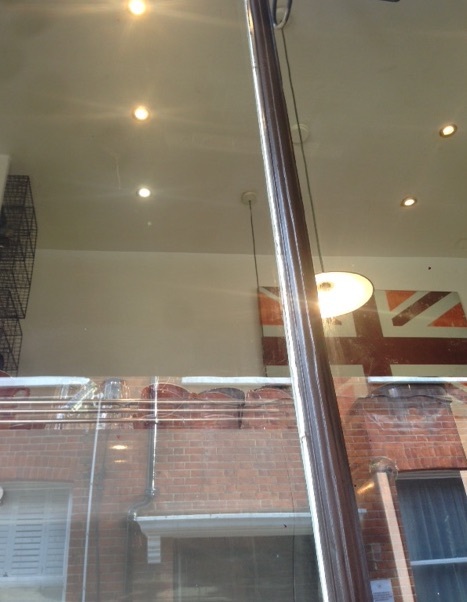 The walls of the building opposite were reflected in the windows of the café but looking inside, I noticed the lights which appeared to be LED lightbulbs set-back into the ceiling. Along with requiring less energy to power than conventional or halogen lightbulbs, LED lightbulbs in a café offer another, more poetic advantage for the café: they have a connection to the drinks being served and particularly tea. It’s all about diffusion. At the heart of an LED light, there are two materials that form a junction. On one side of the junction is a semiconductor material that conducts electricity by means of electrons. Electrons conduct electricity in metals and are the ‘normal’ way that we consider electrical current to be carried. On the other side of the junction is a different semiconductor, one that still conducts electricity but this time does so with carriers called ‘holes’. You can view the electrons as having a negative charge and the holes as having a positive charge. What happens when you put a tea bag into a cup of cold water. How long until the water becomes ‘tea’? But what happens at the junction? Is there really a sharp barrier between these two types of material? 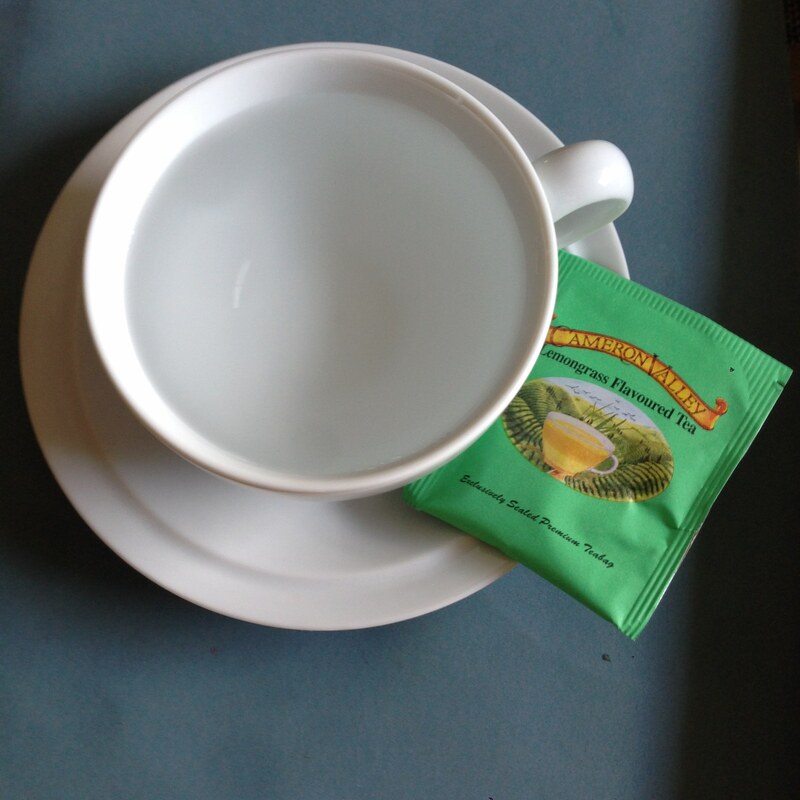 Think about putting a tea bag in a cup of cold water, does the tea bag just sit there or does it slowly, very slowly, start to diffuse tea into the cold water? It is a similar thing for the two materials. Slowly the electrons diffuse into the hole material and the holes into the electron material. In fact, mathematically, the same equations describe the process in the junction as in the tea cup. But unlike tea, in the LED, the holes and electrons have an electric charge associated with them and so, as they diffuse away from the junction, they set up an electric field across the junction. It is this electric field that eventually stops any further diffusion of electrons or holes across the junction and sets up the conditions necessary for LEDs to emit light. It would be like having a tea bag that diffuses tea into the cup until it is perfectly brewed and no further. Of course, there is much more than this to understanding LEDs. If you’re interested, there is further information here. I find it fascinating however that what happens in your tea cup, is also happening on many different scales in many places in the universe. And of course, in the lighting of cafés and coffee houses around the world.